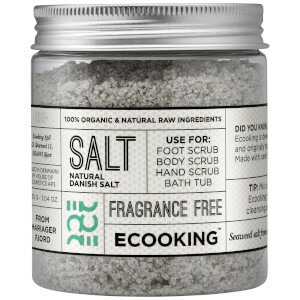 Feel revitalised with Ecooking Bath Salt, a tub of natural Danish salt from Mariager Fjord. Utilising 100% organic and natural Danish Seaweed Salt, the Seaweed is dried out and then returned to the water to re-soak. After this, the Seaweed is then re-dried, resulting in an ashy and salty substance chock full of vitamins and minerals, including Magnesium, Calcium and Potaassium. Natural and fragrance-free, the salt can be used in a multitude of ways, including in the bath or as a body scrub for the face, feet and hands. 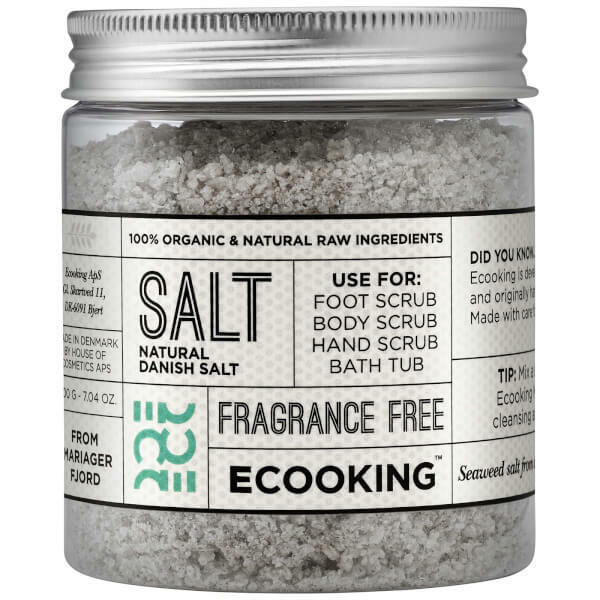 Mix Ecooking Multi Oil with the salt and you have a wonderful body scrub. Mix a teaspoon baking powder together with three spoons of salt and a little oil, and you have an outstanding face scrub. If you have had an tanning mishap, mix the juice from a lemon with the salt and scrub your skin. Minerals**, Magnesium**, Calcium**, Potassium**, Sulphates**, Natural Vitamins**, Natural Iodine**.